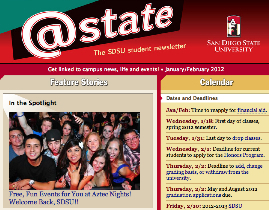 In 2005, @State — SDSU’s first official student online newsletter — was launched. Connecting students with information on programs and services offered by Student Affairs and Associated students and connecting them with campus news and involvement opportunities, @State also provides positive tips for academic success. SDSU was a top producer of Fulbright Scholars in 2010-2011. Fulbright grants fund international educational exchange experiences for scholars and others. Counseling & Psychological Services’ Bounce Back Retention Program is a resiliency-based academic skills program for students on academic probation. Participants have higher GPAs and are more likely to be removed from academic probation. 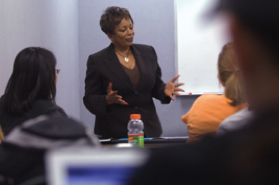 A record number of 961 EOP students applied for graduation in 2010. Seven of these were Guardian Scholars, former foster-care youth who receive special help with needed resources such as health services, career planning, disability services or financial aid. Compact for Success offers guaranteed SDSU admission for Sweetwater District students upon successful completion of required benchmarks, and it provides support to Compact Scholars and other SUHSD students so they can be successful at SDSU. Summer Reading Program: In collaboration with Undergraduate Studies, Student Affairs helped to establish the Summer Reading Program in 2004 (now known as One Book, One San Diego). It involves continuing students, new and transfer students, faculty and staff in a common literary experience, as everyone reads the same book. The experience allows the entire campus community to share in the orientation of its newest members as they transition into university life. Helping students with developmental needs: Student Affairs and Academic Affairs collaborated to develop the 2009 Summer Program for incoming freshmen with remedial needs, who are most at risk of attrition. 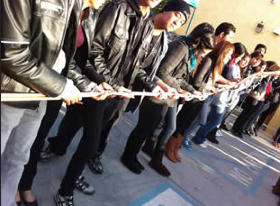 In 2010, more than 50 students were enrolled in the program as it entered its tenth year. Student Affairs has created a unique outreach collaboration with Casa Familiar in San Ysidro, a low-income border community in San Diego. The collaboration has resulted in a facility called "Casa Azteca" located in San Ysidro. Casa Azteca provides commuter students living in the area with many of the same services and programs available to students living on campus — right in the students’ own neighborhood. The convenience and availability of more intensive services has resulted in improved academic success rates for the San Ysidro commuter student population.